If you’re a football fan like me, every summer, you start counting down the Sundays until September when college and pro-football resume. In our house, the kids know homework has to be done before kickoff and all game day appetizer requests are made before the teams take the field. While we haven’t been fortunate enough to organize a football tailgate with friends in the parking lot of MetLife Stadium (go Jets! ), or managed to take the kids on a field trip to watch the Fighting Irish battle the Nittany Lions, we’ve recreated that unique tailgating atmosphere at home. Whether you’re planning to set up a tailgate in the parking lot of a stadium on game day, or you’re just inviting some friends and family to your home theater, here are my top 10 tailgating ideas! Support your team by displaying their colors. From pop up branded tents to colorful balloons, get into the game day spirit with your outdoor decorations. If you’re tailgating in the Stadium parking lot, your décor can also serve as a way to let your friends know where to find you! From yard line garlands to football pom poms, turn your tailgate party home and table into a veritable football field! Check out this link for 20 DIY football decorations for great football party ideas. 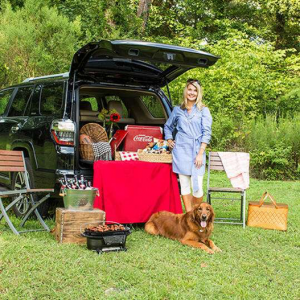 For that authentic parking lot tailgate feel, turn the SUV in your driveway into a buffet table. Drape the back of the SUV with a colorful tablecloth, accessorize with paper goods and utensils, and set up your pre-game bar. When it comes to tailgate fare, you want to serve finger foods. Cowboy Caviar and hot dogs are easy to eat and are great menu staples. During the winter, the slow cooker is your go-to portable kitchen tool that’s perfect for making turkey chili. For quick and easy tailgating recipes, click here! Class up your tailgate with a ‘make your own Bloody Mary bar, and make sure you have plenty of ice in the cooler for the beer drinkers. Whether you want to serve the adults a little Irish coffee, or keep the kids warm with some hot chocolate before and after they throw the football around, stock up on thermoses before your next winter tailgate. 7. Cool down the grill in no time! We love tailgating party hacks and this one was a favorite; it will keep you partying in the parking lot or outside your home instead of rushing to clean up before kickoff. If you’re using a charcoal grill, pour the glowing coals into a metal bucket and then use ice from the cooler to help cool them down! Ward away the chill during your tailgate with game day blankets! Etsy has an entire category for folks looking for blankets sporting their college colors or their favorite NFL team. Roll up a couple of blankets and set them out in steel pails next to the buffet table. When the temperatures dip low but the sun is still out, your guests will appreciate your thoughtfulness! When you’re ready to move your tailgate inside, make sure you’ve equipped your home theater with the right flooring to withstand boisterous guests and the inevitable spills. I love this Mohawk Home Essential Spaces Circuit area rug. Available in four beautiful colors, it’s made with SmartStrand Forever Clean technology that permanently resists spills and stains. The stain protection is built in and will never wash or wear off, so it can flawlessly handle gameday spills. Don’t wait for your guests to leave to clean up! Set out plenty of garbage bags and pick cooking utensils for your grill that can be easily stored until after the game! This way, you keep your tailgate clean and tidy, and no one misses out on hearing the kickoff whistle. Do you have any tailgating hacks or tips to share? Let us know in the comments!